Last Tuesday I taught an aquatics class for my job as a naturalist at the Lee & Rose Warner Nature Center. After lunch, I stopped my rowdy, sugared up boisterous group of nearly thirty third graders and explained to them that we should walk quietly to the lake as there was a chance we just might see an owl. It was possible but I didn't think probable. They quieted down about as much as you would expect and sure enough, just a little down the trail an owl sprung up from the ground near the trail. It perched in a tree and watched us walk on by. It didn't bother to fly away, it just sat there until we left. I wish being a naturalist was always so easy and I could conjure up any species just by declaring we would see it on our hike. 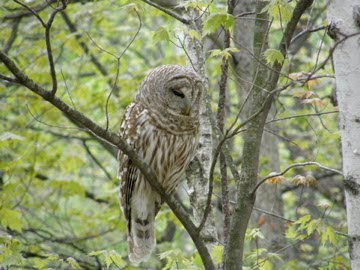 Back in the dead of the winter, my co-workers and I started to see and hear Barred Owls in the woods. 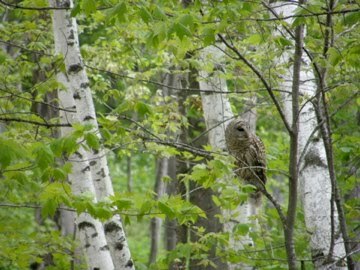 Hearing owls on site, especially Barred Owls is not unusual. Seeing them is slightly less common. Most of the staff saw the owl before breeding season set in but I missed out. Once breeding began the owls quieted down and were less conspicuous in general. The owl on Tuesday was the first one of the year I'd seen. In the past month, sightings have increased and in particular one type of sighting. People are seeing owls hunting. Two groups of school kids walking the same trail saw a Barred Owl swoop down and catch a mouse or vole directly in front of them. A week later, two staff driving a small maintenance vehicle down the same trail saw what I would assume is the same bird land right in the middle of the trail and catch a rodent. It just stood there watching them before it flew to a nearby tree to eat. Word drifted in of other encounters as well. This was the same area I saw the owl with the kids this week. Yesterday, to up the ante as it were, the owl appeared right in front of our building and didn't seem to care as kids walked past and cars drove by. That's when I snapped these photos. The owl was perched in a small maple and had been there for much of the day. The tree was only ten feet or so from the driveway. This was a gorgeous bird. I am a raptor handler for outreach programs and I take our captive Barred Owl on the road for shows. If I had to guess I'd say this was a female owl simply based on size. Female raptors are generally larger than males. I also noticed that this owl seems to be a bit more fulvous colored (that beautiful rustyness) than other Barred Owls I have seen. I also admired how beautiful the tail was on this bird. Captive birds tend to have more beat-up looking tails. We aren't just seeing a barred owl in the woods, groups are repeatedly and somewhat regularly reporting seeing an owl catch food. I can't help but wonder if this owl has learned that when groups of people, especially kids, walk through the woods they tend to scare mice and voles into darting out into the open. The area where the owl was when I took the photos was where a school group ate lunch the day before. Any crumbs of food on the ground have likely attracted rodents. 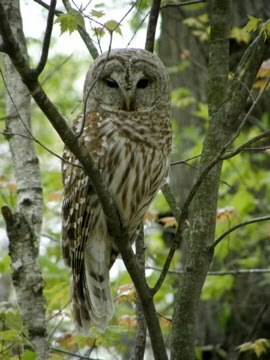 I shared my thoughts with some of our veteran bird banders and they shared a similar story about Barred Owls learning novel hunting strategies in the past. To understand, it helps to know a little about bird banding. A bird band is a small metal band placed around a birds leg (technically their foot) by researchers. The band has a unique ID number on it. If other people re-capture the bird then scientists learn about migration, longevity, etc. by looking up the info on that particular bird. In order to catch the birds, banders put out long, nearly invisible nets in the woods. We've been banding at the nature center for over forty years. About 15 years ago, the banders found large holes in one particular net. They discovered something was eating the caught birds right out of the net before they could get to them. Watching carefully, they noticed that every time they set up that particular net, an Barred Owl would come and watch it. The bird would swoop down and eat the birds as soon as they got caught in the net. The owl had learned that food was easy to get when humans showed up at this location. I'm curious whether or not a similar thing is happening here. As spring progresses, it will be interesting to see if this owl continues this curious hunting behavior. I've hunted with a falconer friend who would within a month of capturing a redtail hawk have it flying free and returning to his fist when called. Hunger, not loyalty, was the key that bonded the hawk to my friend. These hawks very quickly learned that the handler was a source of food when hunts were unsuccessful and would rarely stray very far away. The hawks would follow us around as we beat the brush piles trying to flush rabbits and it didn't seem to matter who it was that was jumping on brush piles. They picked up on the relationship between people and people as hunting partners with just a couple of rabbit flushes, even if the rabbits escaped. On another occasion, during the great northern owl invasion a few years ago, I had two different owls (one northern hawk owl and one great gray) fly past me very slowly and circle within literally feet as they watched me intensely. It may have been that photographers were feeding these two particular birds. If that was the case, the owls learned very quickly the relationship between people and food. Very interesting Gordon. Another example that comes to mind are birds that follow tractors and boats because of their increases success in finding food when doing so. Those are good points. And we can't forget how quickly bears learn about the association between humans and food. Last year on a Canadian fishing trip, to the aptly named Eagle Lake, eagles from all around the lake would start to converge on us as we jig-fished off from some rocky points. Seems that some of the resorts would dump fish carcasses on these long favored spots and the eagles knew boats approaching those spots almost always meant a meal. Loons also would hang around our boat as many anglers would toss them dead bait minnows. On another note, do animals associate the presence of humans with sanctuary? My Dad told the story of a heavily panting whitetail doe being pursued by two dogs that ran up to him and stopped about 10 feet away. The dogs stopped about 50 feet away and skulked about. After regaining her breath, the doe sprinted off with the dogs in pursuit. Never knew what to make of that story, but then something similar happened to me twice in one day by does being pursued by rutting bucks. Mountain goats in the area of Sperry Glacier Chalet in Glacier National Park's backcountry will often sleep on the building's raised veranda. According to the managers, the goats use the presence of humans to reduce the threat of predation by grizzlies. One morning I had to nudge a goat with the screen door to get her to move so I could leave. This is a great post on owls using humans to gain a hunting advantage. I never would have considered this phenomenon with raptors before reading your post. Obviously I am familiar with gulls following fishing boats and the like, but owls letting us stir up their prey for them, amazing. 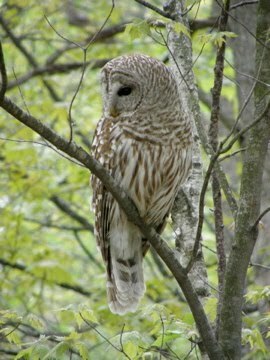 Your photos of this beautiful Barred Owl are gorgeous too! Some owls do often hunt on roads (paved or unpaved), trails and other cleared ground, where rodents etc are easier prey while crossing the flat open surfaces. This also increases our likelihood of encountering and noticing the owls.